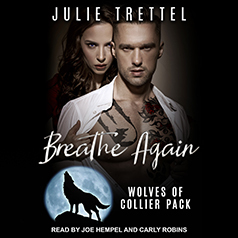 Julie Trettel presents the first book in her Wolves of Collier Pack series. Contains mature themes. Cole Anderson has always known who his one true mate is, but the rejection he suffered at her hands was too much to bear. Still, it helped shape him into the man he is today. He swore he'd never return to Collier Pack, but under his Alpha's orders, he has no choice but to go for the celebration ceremony as Thomas and Lily step up as the new Alpha and Pack Mother. He knows he'll have to face her. But will his heart survive it? Fifteen years ago Elizabeth Collier was little more than a child. She had always had a strong sense of duty to her Pack and at the time thought she was doing the right thing by rejecting her one true mate and taking a compatible one instead. She had not been able to go through with it, and the bond between her and Cole had never been severed. Now he's back, and she's ready to risk everything to prove to him that they are meant to be together. They've each endured years of irrevocable torment with a bond stuck in limbo. Now they must come face to face again. Cole wants to break the bond. But will that end his pain? Elizabeth's ready to fight for them. But can they truly resolve the pain of their pasts and come together at last? Or has too much time passed, and is their chance at love lost? Cole and Elizabeth have been given a second chance at love. Sparks will fly, and tempers will flare. But can the love between true mates conquer all?